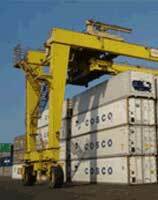 Providing the necessary handling equipment free of charge except handling dues of gantry cranes. 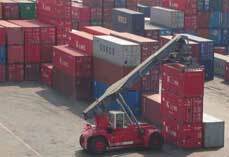 Granting 50% discount on handling dues of export containers and cargoes. Providing electric power for reefer boxes, following up temperature & carrying out minor maintenance operations. Granting 50% discount on handling dues for exported reefer containers,after the free storage period. 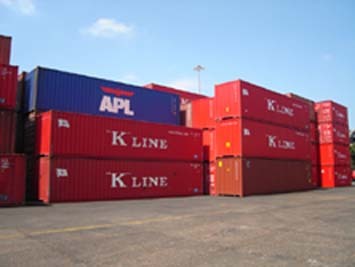 Providing our clients (exporters) with the convenient containers to export their shipments. Providing proper stowage for shipments so as to be received by the consignees in good condition. The import yard area is 75000m2carrying out unloading of L.C.L in C.F.S. warehouse whereby stripping and storing can be processed.The warehouse area is 6000 m2 capable of storing contents of 250 TEU.It is furnished with metal shelves and most updated international storing systems are applied to secure safe cargo storage.It is ensured against all risks.ALL fire fighting equipment are available and it is provided with an automated fire fighting system.Precious goods are preserved in a tight room inside the warehouse.ALL equipment required for stripping, stacking and stowing goods on shelves are available.Such equipment are allocated tO operate inside the warehouses as being battery operated,whereby no exhaust may affect the safety of people or goods. prepared a special area for reefer containers(cooling AND freezing) equipped with all facilities required to supply containers with electricity.The area can accommodate up TO 650 reefer boxes and supply electric current in addition to relevant technical services required. IN case electric current cut off,there is a stand -By power- generating unit to supply reefer containers with electric power.A well - trained technical crew is available to supervise operation of reefer containers and register temperature day and night.The team can undertake minor maintenance works TO preserve continuous operation of reefer containers.PSCCHC provides remarkable facilities for export reefer containers [cooling and freezing] and grants discount 50% of storage dues for export reefer containers. area is 325,000m2 to be used for stacking and handling transshipment containers with approximate annual capacity 800000 TEU. 3 Uints Super Post Panamax gantry cranes with 60 tons load & outreach 58m capable of handling till 22 rows of double full containers. One 50-60 tons Super Post-Panamax Gantry Crane with 50m outreach capable of handling 19 rows of double full containers. 3 units, 40-50 tons Post-Panamax Gantry Cranes with 44.5m outreach capable of handling 17 rows. 1 units,41 tons Panamax Gantry Cranes with 39 m outreach capable of handling 14 rows. 1 units, 80 -100 tons Mobile Harbor Cranes. 23 units, Rubber-Tyred Yard Cranes (RTG). A specialized workshop (dry container) is responsible for maintenance and repair of containers in accordance with (IICL) standard . It can carry out repairs and maintenance for 20 boxes at the same time. Also it is responsible for washing & cleaning containers using hot/cold water & detergents. Its capacity is 600 Box/month.